When your goaltender gets a shutout and is not one of the three stars of the game, you know your team has made a complete effort. 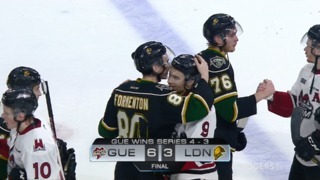 Jordan Kooy of the London Knights stopped all 15 shots he faced as the Knights shut out the Windsor Spitfires 5-0 in Game 2 of their Western Conference quarterfinal series on Sunday afternoon at Budweiser Gardens. Nathan Dunkley and Cole Tymkin each had two goals for London, while Connor McMichael added another. The Knights played a smothering style of defence all day, but Dunkley pointed to the early offence as being a big key to London’s win. Still, Dunkley couldn’t keep from mentioning London’s effort without the puck. “We have prided ourselves all year on defence, and [today] was a real testament to that,” he said. The Knights scored two goals in the opening period and three more in the third and held Windsor to three, five and then seven shots in each of the three periods they played. London assistant coach Rick Steadman talked about the contributions of the entire team after the game. The Knights got scoring from three of four lines and solid play from top to bottom on their roster. 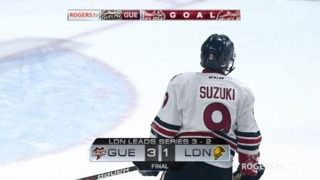 London outshot Windsor 37-15 overall. Dunkley scored the only two goals during the first 40 minutes of the game. The first came on a breakaway at the 9:50 mark as Riley Coome fed a pass out of the London zone to Matvey Guskov, who got the puck to Dunkley. The Campbellford native did the rest as he went in alone and put a deke on Windsor goalie Colton Incze for his first goal of the playoffs. Dunkley struck again at 16:01 as he swooped in behind the Spitfires’ net and wrapped the puck around and in with congestion in the crease. 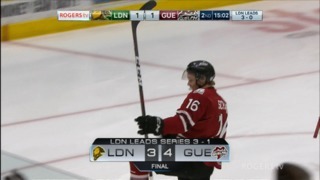 London added three more goals in the third period. Antonio Stranges set up McMichael, and he snapped a shot off the post and in for a 3-0 London lead. Kevin Hancock found an open Tymkin for the fourth London goal, as Tymkin scored from a sharp angle. Tymkin finished the scoring with his second of the afternoon as he was sent in alone by Billy Moskal. Tymkin made a beautiful move to his backhand and lifted the puck into the net, and the Knights carried their 5-0 lead to the finish. Nate Schnarr had a big afternoon for the Guelph Storm with four assists to lift them to a 7-0 win over Kitchener and a 2-0 series lead. Owen Tippett has led the way for the Saginaw Spirit in their series against the Sarnia Sting. Tippett leads all playoff scorers with three goals and three assists, and the Spirit lead Sarnia two games to none. After Saginaw survived an opening period in Game 1 that saw them outshot 14-2 and down 2-0 to the Sting, they have rebounded to take control. Sault Ste. Marie evened their series 1-1 with Owen Sound on Saturday, but the Attack still made them sweat a bit. After winning Game 1 in overtime on Thursday, Owen Sound scored three goals on 21 shots and managed to get to within a goal at 4-3 after an early Greyhound surge. Sault Ste. Marie won Game 2 by a score of 6-3. North Bay rebounded from a 2-0 loss to Niagara in Game 1 with a 5-2 road victory in Game 2. The Battalion jumped out to a 2-0 lead and then survived a momentum-swinging two goals by the IceDogs in the first five minutes of the second period. Sudbury gave their fans a sendoff with their second win in as many nights against Mississauga. After a 5-2 win in Game 1, the Wolves got an overtime winner from David Levin on Saturday in Game 2. Due to scheduling issues, the teams are right back at it for Game 3 in Mississauga on Sunday night. The Ottawa 67’s pulled ahead of Hamilton over the second half the game for the second time in a row and won 5-2. Ottawa leads the Bulldogs two games to none. 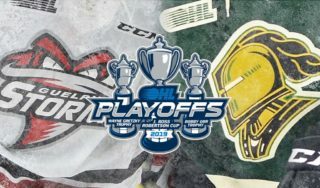 The series between the Knights and the Spitfires shifts to Windsor for games 3 and 4. Game 3 will be played on Tuesday at the WFCU Centre. Game 4 happens on Thursday.